Chromosomal translocations involving the ETS transcription factors, such as ERG and ETV1, are frequent events in human prostate cancer pathogenesis. In particular, the TMPRSS2-ERG fusion gene has recently been found to be the most frequent gene rearrangement in prostate cancers, occurring in 45-65% of North American patients. Recent reports have demonstrated a strong correlation between the presence of the TMPRSS2-ERG rearrangement and expression of the ERG protein. Other studies have shown a strong concordance of ERG positive prostatic intraepithelial neoplasm (PIN) in ERG positive carcinoma in prostatectomies (with 99.9% specificity). 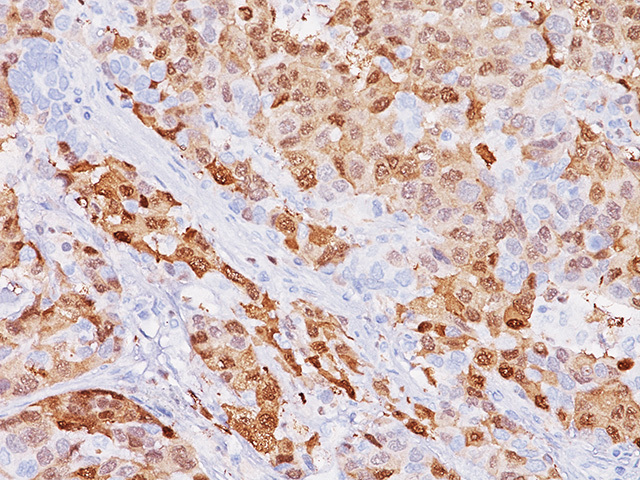 Therefore, as a hallmark of the TMPRSS2-ERG chromosomal translocation, ERG expression offers a rare, but definitive marker of adenocarcinoma of prostatic origin, and a unique opportunity to identify a potentially clinically significant subset of prostate cancer patients by IHC. 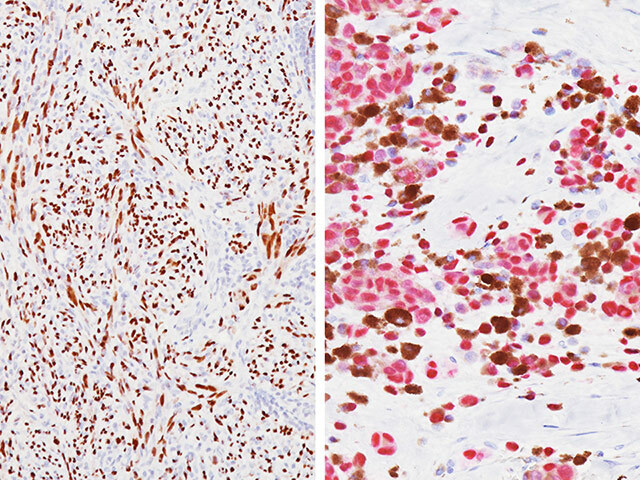 Given the ease of performing IHC vs. FISH, ERG protein expression in formalin-fixed paraffin-embedded tissue may be an extremely useful tool for the routine identification of the ERG gene rearrangement and diagnosis of prostate adenocarcinoma. 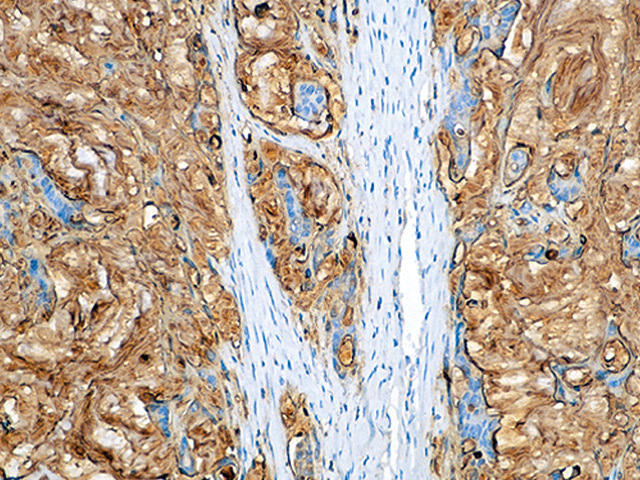 CK5 is a type II intermediate filament protein that is expressed in active basal layers of most epithelia including normal prostate and normal breast tissues. 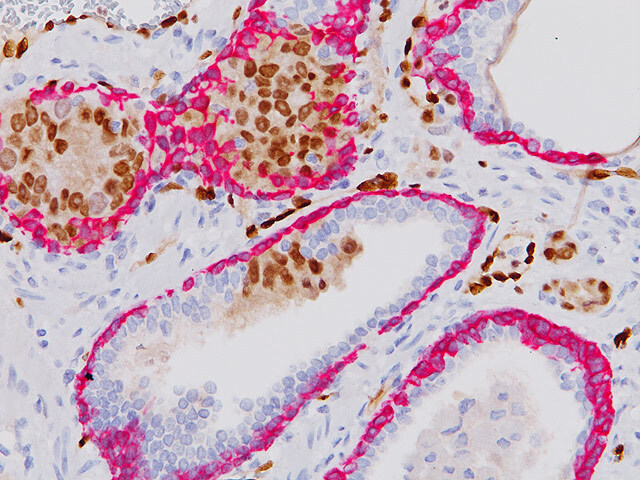 CK5 stains normal basal cell layers in normal glands, benign glands (Benign Prostatic Hyperplasia, (BPH) and prostatic intraepithelial neoplasia (PIN). 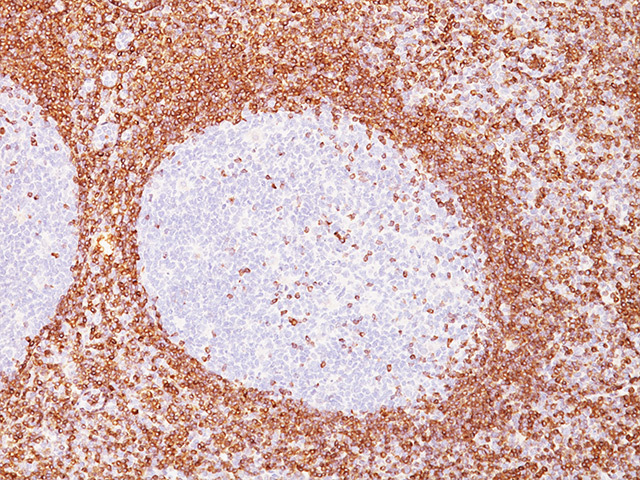 The combination of ERG and CK5 provides a unique stain that identifies the TMPRSS2-ERG chromosomal translocation in prostate cancer (DAB), but also highlights PIN in red; thus helping to visualize ERG positive PINs. 1. Petrovics G, Liu A, Shaheduzzaman S, Furasato B, Sun C, Chen Y, Nau M, Ravindranath L, Chen Y-D, Dobi A, Srikantan V, Sesterhenn IA, McLeod DG, Vahey M, Moul WJ, Srivastava S. Frequent overexpression of ETS related gene-1 (ERG1) in prostate cancer transcriptome. Oncogene 24, 3847-3852 (2005). 2. Kumar-Sinha C, Tomlins SA, Chinnaiyan AM. Recurrent gene fusions in prostate cancer. Nat Rev Cancer 8, 497-511 (2008). 3. Furusato B, Tan SH, Young D, Dobi A, Sun C, Mohamed AA, Thangapazham R, Chen Y, McMaster G, Sreenath T, Petrovics G, McLeod DG, Srivastava S, Sesterhenn IA. ERG oncoprotein expression in prostate cancer: clonal progression of ERG positive tumor cells and potential for ERG based stratification. Prostate Cancer and Prostatic Diseases 13, 228-237 (2010). Sesterhenn IA, Dobi A, Srivastava S, Sreenath LT. Ets Family Protein, Erg Expression in Developing and Adult Mouse Tissues by a Highly Specific Monoclonal Antibody. Journal of Cancer 1, 197-208 (2010). 5. Miettinen M, Wang Z-F, Paetau A, Tan S-H, Dobi A, Srivastava S, Sesterhenn IA. 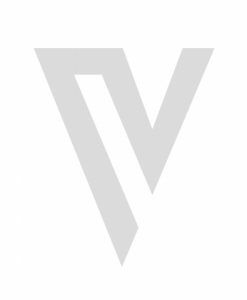 : ERG transcription factor as an immunohistochemical marker for vascular endothelial tumors and prostatic carcinoma. 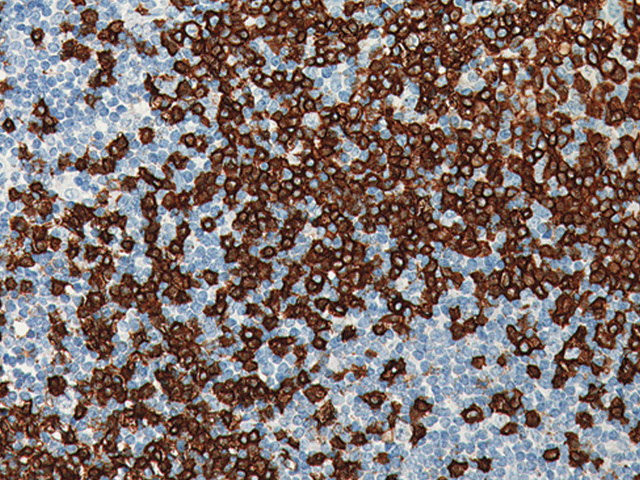 American Journal of Surgical Pathology 35, 432-441 (2011). 6. Mohamed AA, Tan S-H, Sun C, Shaheduzzaman S, Hu Y, Petrovics G, Chen Y, Sesterhenn IA, Li H, Sreenath T, McLeod DG, Dobi A, Srivastava S. ERG oncogene modulates prostaglandin signaling in prostate cancer cells. Cancer Biology and Therapy 11, 410-417 (2011). 7. Trpkov K, Bartczak-McKay J, Yilmaz A. Usefulness of cytokeratin 5/6 and AMACR applied as double sequential immunostains for diagnostic assessment of problematic prostate specimens. Am J Clin Pathol 132, 211-220 (2009). 8. Hameed O, Humphrey PA. Immunohistochemistry in diagnostic surgical pathology of the prostate. Semin Diagn Pathol 22, 88-104 (2005). 10. Clinical and Laboratory Standards Institute (CLSI). Protection of Laboratory workers from occupationally Acquired Infections; Approved guideline-Third Edition CLSI document M29-A3 Wayne, PA (2005).